The French Quarter restaurant you won't find on the tour - Coop's Place. 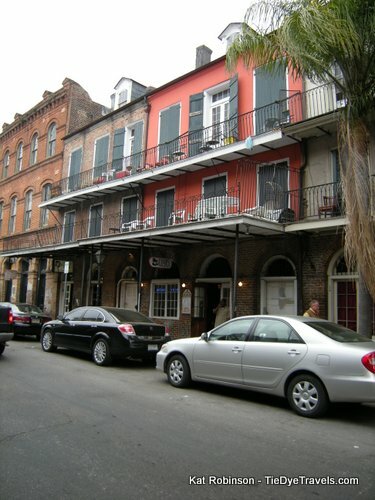 New Orleans is known for jazz, Bourbon Street, history, and good food. And Katrina, but we won't get into that here. If you're not into being drunk enough to puke, Bourbon Street isn't for you. If you aren't a history buff... or a jazz fan... chances are you've come to New Orleans to eat. And what a place to eat. Seems every Food Network special has something in it about New Orleans. 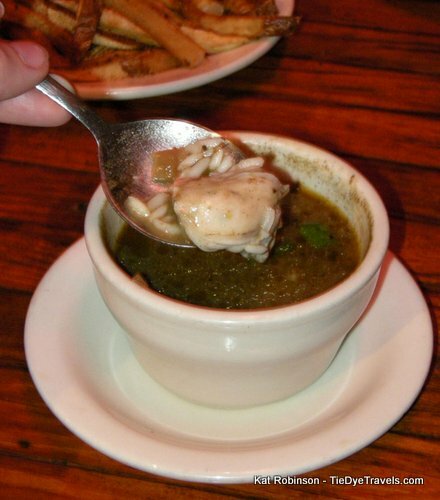 Its culinary contributions to the world include both Cajun and Creole food -- gumbo, jambalaya, shrimp creole, ettouffe, pralines, bread pudding (well, perfection of the creation, of course), blackened anything, Bananas Foster, you name it. 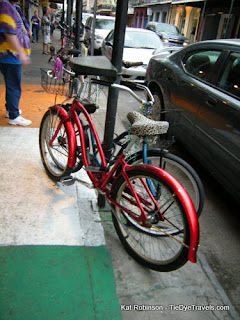 And you can find places that serve these creations all over the Quarter. 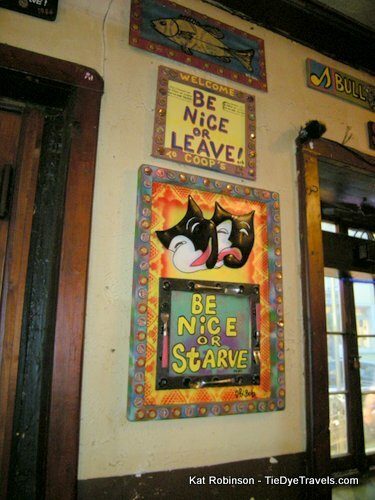 But there's a little non-descript bar and restaurant on Decatur Street that you're not going to find splashed across some full color advertizement. Sure, it's in the Zagat Survey -- but that's about the only place you'll find it mentioned in the guidebooks. some of the best New Orleans fare you can find -- for a reasonable price. My traveling companion and I ventured over to the bar on a windy Tuesday night in March. We stumbled past the plethora of bicycles (apparently newly popular again with the high gas prices) to the door, and found ourselves one available table by the wall. On that wall, you'll find a big chalkboard with the menu. 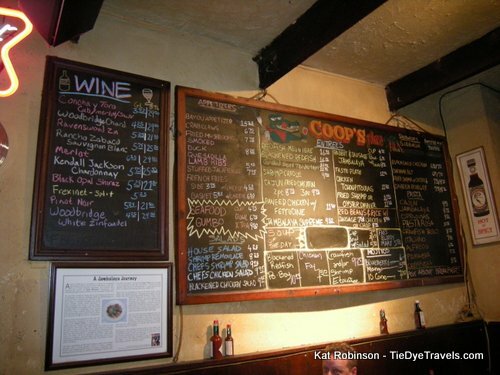 You can have a proper menu, if you want, but it has everything that's above your head -- including the appetizers, the wide variety of pastas, the burgers, the dishes... all there, all priced, all loud and clear in colored chalk. We made our choices and settled down. The floor is rough here, a combination of brick and stone, cobbled together and well worn. 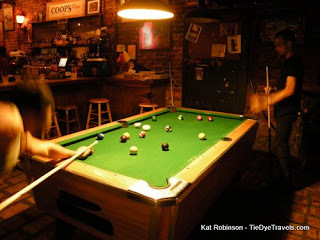 The big bar takes up the center of the room, but there are about a dozen tables, and a pool table in the back. The electronic jukebox pumped out a groovy mix of Big Brother and the Holding Company, Led Zeppelin, and Lynyrd Skynyrd, waiting for someone to challenge it with another choice. The staff were rushed, but thorough. We decided to start out with a trio of appetizers, and it wasn't long before they were brought to our table. They came on plain plates with little more than lettuce for garnish, but that was okay -- the food was good enough on its own. 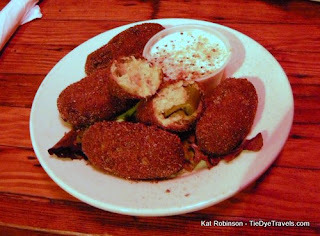 The Crabmeat Stuffed Jalapena Poppers ($7.95) come five to a plate. These firm appetizers reminded me of hush puppies. They were soft and full of cornmeal, both sweet and hot, each with a long thick curl of jalapeno in the middle (instead of a whole pepper). They weren't quite as hot as I feared, but hot enough, and served with a surprising horseradish sauce instead of the traditional ranch dressing. Nice. 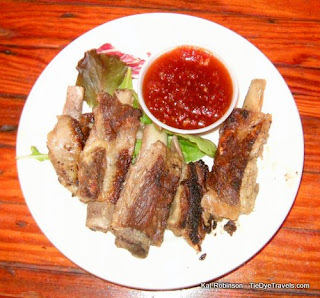 The Charbroiled Lamb Ribs with Red Pepper Jelly ($5.95) are one of the best deals I've seen in the Quarter. Lamb ribs aren't a very common thing, but these were great. They were slightly smaller than pork ribs, but cooked to medium rare and savory, a little fatty but falling right off the bone. The Red Pepper Jelly with its coolness and slight spiciness made a good combination. 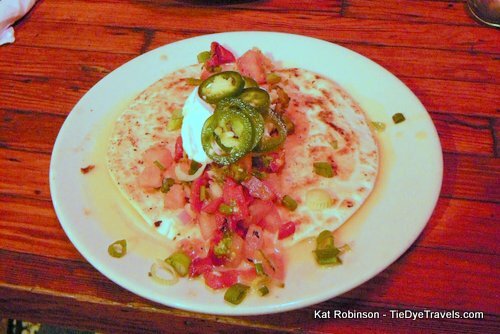 But it was the Smoked Duck Quesadilla ($8.25) that truly got our attention. A meal in itself or an appetizer for two, it's a series of pleasant surprises. First off, there's the well-smoked and flavorful duck -- almost ham-like in its saltiness but with the traditional pull of poultry. Then there was the lovely tomato-bell pepper-scallion accompaniment of pico de gallo type vegetation scattered over the duck and cheese creation. A topping of sour cream and jalapenos crowned it nicely. But it was the sauce the quesadilla sat in that really perked us both up and surprised us. It was a perfect, sweet accompaniment to the dish. We both guessed at the base -- I thought it might have been mango on first try -- before word came back from the chef -- this heavenly ambrosial syrup was a reduction of orange marmalade. Who would have guessed that? So good. We didn't have time to relax before our main dish came out. Since we were in a sampling mood, we'd decided on Coop's Taste Plate ($12.95), a combination of several local favorites. 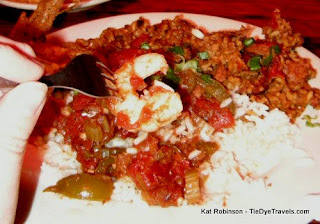 Because of our combined allergies, we substituted french fries for the red beans and rice, but out came the rest -- seafood gumbo, shrimp Creole, rabbit and sausage jambalaya, and a piece of Creole fried chicken. The sight of so much food can make one ache. We gave it a try. 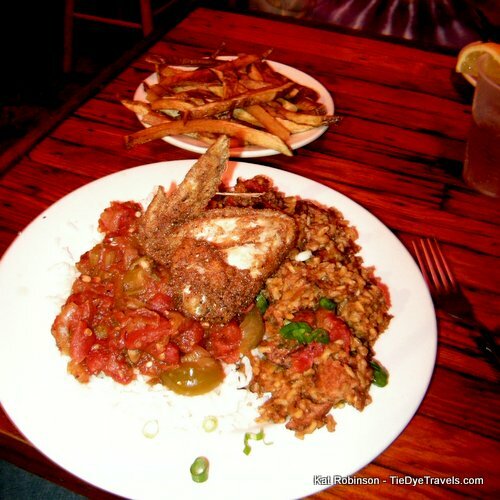 The rabbit and sausage jambalaya is spicy, but not as spicy as you might suspect a Quarter jambalaya to be. Instead, it was spice-ful, with nice bite-sized chunks of strongly flavored sausage and savory rabbit. Not a hint of gaminess here... it amalgamated quite well. Where the jambalaya wasn't spicy, the shrimp Creole was, in just that "hey, wait a minute" sort of way that a good afterbite has. Loaded with tomatoes and large shrimp, the dish completely deliniates itself from other regional offerings. The spice isn't evident at first, but moments after my first bite I was reaching for the iced tea. 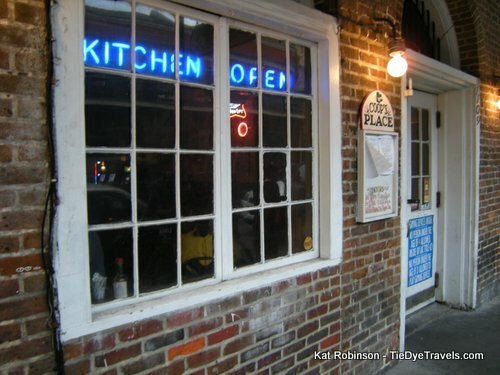 The Creole fried chicken was pan-fried instead of deep fried, with a cornmeal and flour dressing. Once again, the bite came late -- not apparent on first taste, but drink-inducing moments later. It was savory and full spiced and didn't lack for good seasoning. The gumbo, though, was to die for. 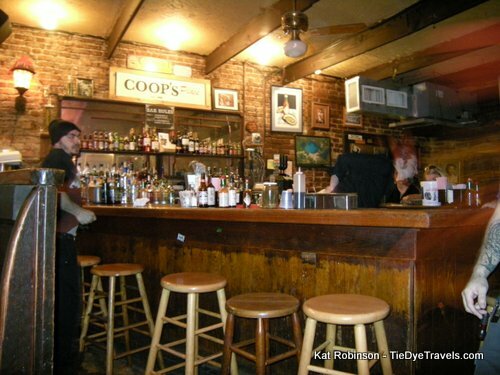 Coop's uses a very, very dark and patient roux, and it shows. This is a file gumbo -- no okra here -- and there's no skimping on celery or peppers. Or, for that matter, the meat -- large chunks of crabmeat and quarter size shrimp lurk beneath the surface on the submerged bed of rice below. 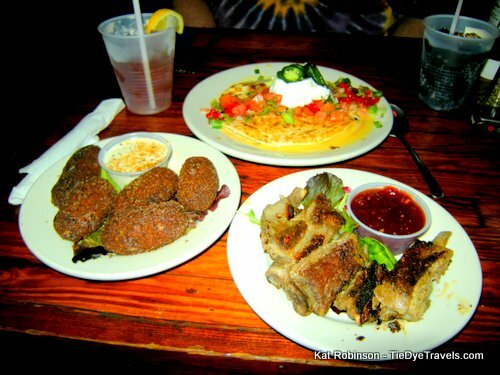 One taste plate, three appetizers, and no room for dessert -- though, if you really want dessert, there are plenty of places nearby that will serve you beignets, fudge, or Bananas Foster. 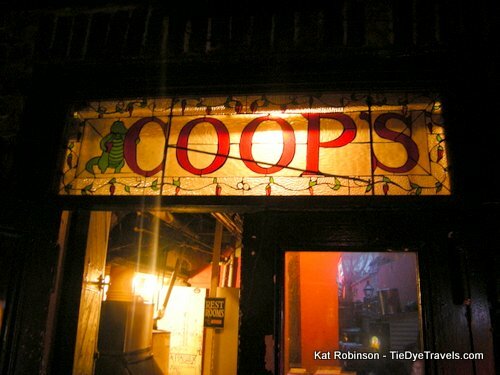 Coop's Place isn't the sort of establishment that spends a lot of time and effort on frou-frou items like that. But it does have a mean mojito (in three flavors, at that) and a wicked Bloody Mary. 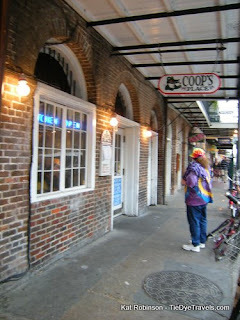 If you find yourself in the Quarter and want to dine without breaking the bank, check out Coop's Place. It's at 1109 Decatur Street -- across from Margaritaville. And don't worry if you're out late -- it's open until 4am. And you can call if you like -- (504) 525-9053. UPDATE: They have a great burger po'boy, too. 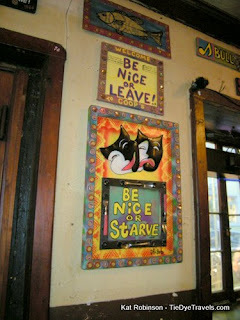 I don't know if ti's still there, but Petunia's in the French Quarter was one of the best breakfasts I've ever had. Clover Grill was a close second.